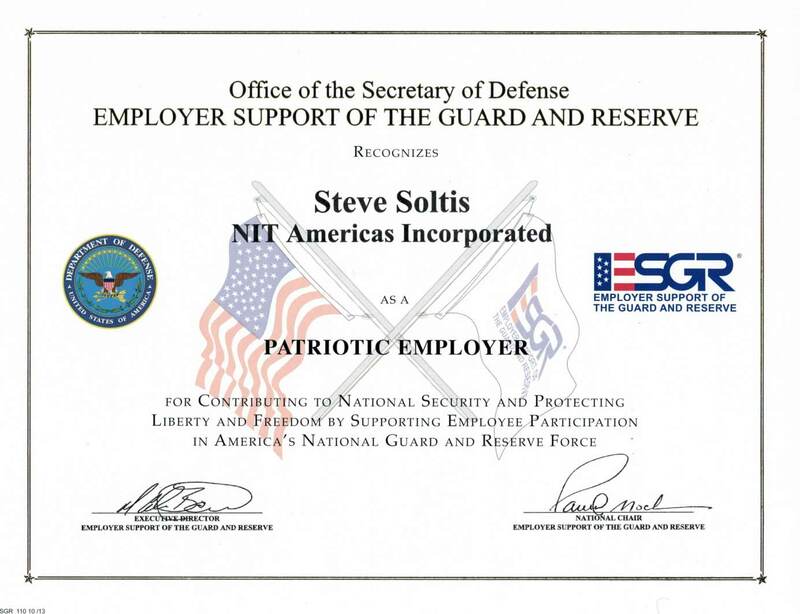 The Office of the Secretary of Defense presented NIT Americas Inc. management team the Employer Support of the Guard and Reserve (ESGR) Patriot Award for support provided directly to a Service member and his family while assigned on State Active Duty orders during a 3 month deployment with the 188th Engineer Company (Vertical) unit, North Dakota Army National Guard. The Patriot Award reflects the efforts made to support citizen warriors through a wide-range of measures including flexible schedules, time off prior to and after deployment, caring for families, and granting leaves of absence if needed. This award is presented to Employers who go above and beyond to support the Soldier's mission and obligatory duties to his or her Nation.